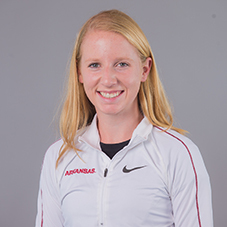 Debuted for the Razorbacks at the Cowboy Duals (Sept. 1) landing a time of 11:48.60 … In the Southern Stampede Larkan was able to place eighth overall and had the fifth-best time for Arkansas at 19:00.23 … The Chile Pepper Festival was her last meet of the season where she ran a 19:11.10 which was a top-20 time for the Razorbacks. Two-time 3A cross country state champion … Earned back to back All-State honors. Born on June 17, 1997 … Daughter of Lee and Mary Larkan … Has one brother, Jordan … Majoring in business … Aspires to attend law school following completion of her bachelors degree.